Some years ago, The Legal Genealogist addressed the question of what a moiety was in a land record. And, of course, because a moiety in real estate creates a right to roughly equal shares,1 and because joint and common ownership gives all owners some rights to the land, that leaves open the question of who, ultimately, gets what part of the land. And that, of course, is where partition comes in. A kind of record we see a lot, particularly in the probate records that are coming online fast and furious these days… but may not understand well enough. We’ve talked about this before, but it was a long time ago,2 and sometimes we all need a reminder. Usually, the party who wanted the land divided would file an action for partition. If the court granted it, it would issue a judgment, called a judgment quod partitio fiat,7 ordering the partition to occur. 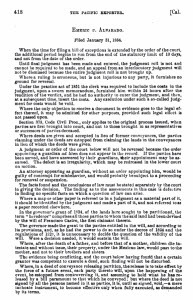 The actual division — deciding who gets what — was often done by a group appointed just for that purpose, called a commission of partition.8 In older records, those folks might be referred to as extensores.9 If the proposed division was accepted and approved by the court, one or more deeds of partition10 would be entered, giving each landowner single title to his or her part of the land. For a GREAT example of partition, take a look at the California Supreme Court case of Emeric v. Alvarado, 64 Cal. 659, 2 P. 418 (Cal. 1884).11 It’s really a wonderful read. It’s a decision on an action to partition a ranch of nearly 18,000 acres known as San Pablo in Contra Costa County. The opinion itself is an amazing history lesson: all about land grants in early California (the family patriarch, Francisco Maria Castro, applied for his grant in April 1823) and all about how land inheritance worked under the Mexican and Spanish laws in effect at the time. What an intriguing pointer. As always, the researcher must ascertain what Court would be responsible for this enterprise in a given time and place. In one County of my acquaintance, the Probate Court burned, but the Court of Common Pleas did not, enabling survival of some excellent partition and other records. Even when an actual land division did not take place, the responsible Court (say, Orphans Court or Superior Court of Law and Chancery) probably compiled a roster of heirs such as you detail in California, to determine whether a parcel might equitably be divided, or should be sold and the proceeds divided amongst the heirs in proportion to their degrees of inheritance. In one case I enjoyed discovering, the catalog of heirs was numerically and generationally similar to what you list, but the parcel was about 3-1/2 acres. Some heirs’ shares of the sale proceeds were but a few cents. My day is made when I discover there’s a Chancery suit involving someone I’m researching. Those cases can be a motherlode of genealogical information. There’s no question about that — chancery records are terrific.